What advice do you have to help with dog anxiety due to thunder & fireworks? Sam is a 5-year-old Labrador Retriever/Rottweiler X female. If she hears these sounds in the house she immediately hides in the basement. If she hears it while we are already walking outside she wants to run home. She has even tried to hide under a car or in phone booth. I pretty much end up running home with her. Last summer was the worst because she got to the point where she would not even want to go out for a walk after it got dark and she loves her walks. Even during the day was touchy. If she heard a car backfire or a firecracker go off she would want to go home.I usually work during the day and when it’s really hot I’d rather take her out at dusk. She didn’t get back to normal until the weather got cold. Spring will soon be here so will the thunderstorms and fireworks. I hate to see her so scared. What can I do? Spring and summer are very tough times for noise phobic dogs. Dogs with this particular problem have a variety of similar characteristics. They usually are anxious around any overhead sound. Fireworks, hot air balloons, roofers etc. Additionally, symptoms may not appear until around the equivalent of puberty or even older and often no matter what is attempted, get worse as the dog matures. As if the thunder phobia isn’t enough another serious issue suffered by some anxiety oriented dogs is that they seem susceptible to an obsessive compulsive behavior described as acral lic granuloma in which the dog obsessively licks at its fore paws usually but also flank and tail. I find this is often incorrectly attributed to a skin disorder which of course in some cases it may be but if any of the other anxiety characteristics I’ve mentioned are present and treatment for a skin problem is not going anywhere it would be time to have a chat with the veterinarian to consider a behavior issue rather then physical. On the flip side of the coin, there is an ironic upside when you have a dog of this sort. These dogs are often of an overall gentle temperament and take it to heart when someone is unhappy with them and so try very hard to please. They are usually otherwise more behaved and easily trained then other dogs. This is a very tough problem to treat. There are a myriad of approaches used in attempt to extinguish the behavior or at least relieve the symptoms. Anti-anxiety drugs are currently a popular suggestion but must be taken 8 to 12 weeks in advance and in my experience have very little effect. There are naturopathic remedies as well and once again I’ve not found them to be of any help with the dogs I’ve treated. I wouldn’t rule them out but based on hundreds of cases I wouldn’t hold my breath. I’ve had some success believe it or not with earplugs I’ve fashioned for dogs but not enough to go into the “Sound Be Gone” doggy ear plug business. 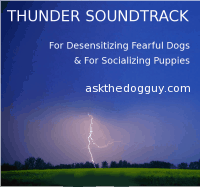 Desensitization via a quality sound effects CD and a good set of overhead speakers might help with fireworks sounds but unless the thunder phobia issue is caught early it eventually devolves into anxiety well in advance of the storm, likely due to the dogs ability to detect the change in barometric pressure and change from negative to positive ions preceding a storm and desensitization to the sound alone has little value. I think this problem develops for a variety of reasons one of which is perhaps hard wiring. Not so much as in an innate fear of thunder but for anxiety in general. I’ve seen blood lines of some dogs that were all a little anxious some extent and in one manner or another. However I’ve found that it is the imprinting stage early in life that is behind most of this sort of problem. Dogs subjected to constant exposure to any sound, sight and smell in a positive or indifferent manner between 3 and 12 weeks of age usually never have a problem with those sound sights and smells. However, no exposure or negative exposure can result in a life long problem. Puppies born in the winter may never have any exposure to loud over head sounds such as thunder. Summer puppies may not either during the 3 – 12 weeks of age window. Alternatively they might but only once and were frightened by it or been influenced by a mother with a fear or shown some trepidation and had the breeder or owner attempt to console them unintentionally reinforcing that it was something worthy of concern. This is why it is so important to have a breeder that knows what they are doing from the behavior component of puppy development. Puppies can be exposed to sound effects CD’s, taken to airports, taken regularly to a local gun club etc. This is something the breeder should have well under way before purchase and continued after the fact up until 12 weeks of age. This is very important and a good question to ask of a breeder before deciding to buy. I think you’re best bet is to take this letter and go have a chat with your veterinarian and a really good dog trainer and see if you can develop a strategy to desensitize your dog but I have to warn you, I have seen very few of these cases resolved and come thunderstorm season it becomes an anxious period for dog owners as well as their dogs.